Crooked politicians, corrupt businessmen, gangland racketeers -- they're all fair game for the masked man with the gas gun! 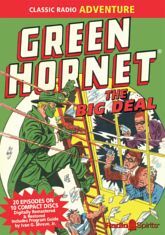 Join Britt Reid, daring young publisher, and his faithful valet Kato as they crusade against crime in twenty thrilling episodes of The Green Hornet! They can always count on secretary Lenore Case and ex-cop turned reporter Michael Axford, who've got their ears to the ground and their eyes open. When powerful people prey on the vulnerable, Britt uses the press (and a little pressure) to balance the scales of justice! Includes many rare episodes, and a Program Guide by Ivan G. Shreve, Jr.